Robert Lachowicz is targeting a group bronze medal when Great Britain face Poland in the final game of their World Championships on Saturday. 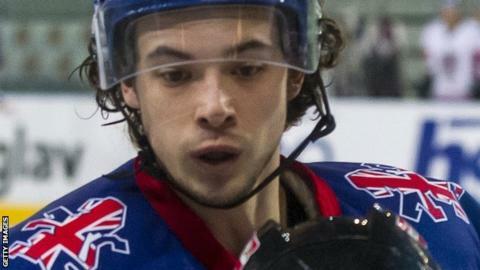 The Nottingham Panthers forward, 24, helped his side beat the Netherlands 4-3 on Thursday night in Vilnius. GB can go third in Division 1B if they beat the Poles in regulation time and Lithuania match that against Croatia. "We have played well at many points of this tournament, so there's no reason why we cannot beat Poland," he said. "The bronze medal is certainly something we want to end the tournament with." Doug Christiansen's Great Britain team started the tournament in disappointing fashion as they lost 4-0 to Croatia, but they bounced back by defeating Romania 4-1. A 2-1 defeat by hosts Lithuania followed, before the hard-fought victory against the Dutch. Lachowicz added: "We came for promotion and it is disappointing that we have been unable to do that, but it is what it is and we now must focus our efforts on something else. "We know we have to rely on another result, but we need to get our job done first and hope for the best." Poland have already won the group with victory in all four of their games to gain promotion to Division 1A.